Co-founder of Wikipedia, Jimmy Wales, has asked Twitter users to create their own neutral Wiki article concerning the GamerGate controversy, amid numerous claims that the articles hosted on his most famous site are biased and incorrectly sourced. 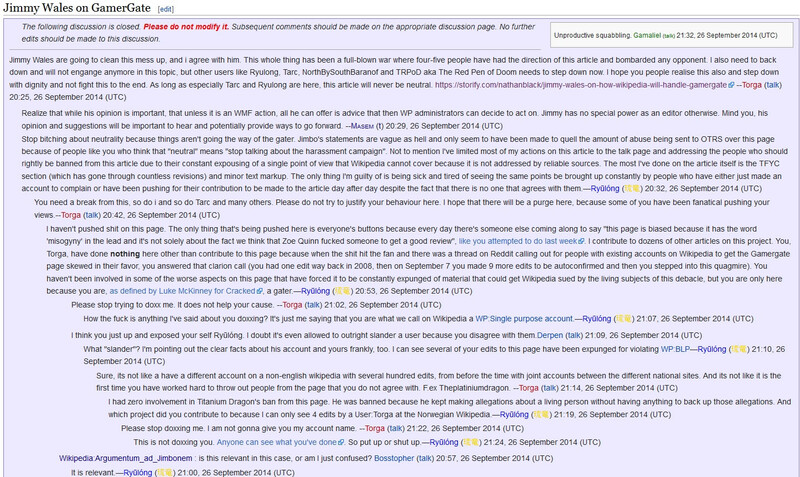 Editor Ryulong, who has been instrumental in the changes to the GamerGate and other related articles, has been in hot water with Wikipedia before in particular for their mass deletion of languages articles. Ryulong has also attacked Wales on his stance of these articles. Another prominent editor, Tarc, who has previously claimed to be neutral in-stance, has sent his condolences to Zoe Quinn, Brianna Wu and Mattie Brice over their harassment and has claimed that “GamerGate neckbeards” need to be “shouted down”. They have also seemed happy that the “narrative is being won” in the media, by the anti-Gamergate side. There have been several controversies surrounding the article, related articles and their accuracy. Many sources such as articles from Breitbart, a right-wing newssite, have been immediately considered not verifiable or trustworthy enough to be considered a source by the wiki, while websites such as Buzzfeed, known for its funny GIFs and clickbait articles, but not its journalism, were fought to be considered reputable. Previously, when the article was edited several hundred times a day, Ryulong attempted to block 36 accounts from editing the article, all of whom edited the article to a more neutral or pro-GamerGate stance. This discussion concerning this was titled “Nip GamerGate in the bud”. Ryulong claimed the accounts were made for the single purpose of editing the GamerGate article, or were zombie accounts. However, almost half of them did not fit these descriptions. The list of proposed users to ban has since been deleted, but can be found in the edits page. Many of the hundreds of edits occurring to the article were wrongly attributed to WikiProject Feminism. The false assumption was linked to a counter on their page, which reported the number of edits carried out on pages of interest, such as the GamerGate article. However, very few of these edits were made by WikiProject Feminism members. Other biased discussion of the article has included the recommendation that the name be changed from the “GamerGate Controversy” to the “2014 harassment of women in the gaming industry” completely ignoring the collusion and unethical behaviour of gaming journalists. David Auerbach, writer for Slate, has also been misquoted by Ryulong in the GamerGate article as saying that “women harassed and threatened … should be held responsible for … GamerGate.” Since contacting Wales, this issue seems to have been resolved. Controversy surrounding the Wikipedia articles has been going on for months, and appears not to be slowing down. While Wikipedia is often known to be unreliable, it is a go to source for many to inform themselves on the basics of several thousands of topics. When articles on Wikipedia such as these suffer from such huge flaws and bias, it is harmful to the validity of Wikipedia as a helpful resource. Hopefully, the related articles can be brought back to neutrality soon, as Wales wishes. EDIT: Since writing Jimmy Wales has asked Tarc and other “POV (point of view) warriors” to step down from this article or has advised admin that they should be forcibly removed. This is a reaction to the Auerbach incident. Some small edits have been made. Thousands of edits have been made to the Gamergate article overall. Hundreds on some days. Just under and not over half of editors Ryulong wanted to ban were regular accounts. And WikiProject feminism made few edits to the page, not none.